Those involved in the community life of St. Andrew’s meet new people, make new friends, and develop lasting relationships with others. We believe that the adventure of faith is an ongoing process of discovery and growth that continues throughout all of life. Our adult programs provide opportunities for people to participate in studies and discussions of varied subject matter and duration of time. Below are the regular Adult ministries that are run at St. Andrew’s. Tuesday: Women’s Fellowship will meet every other week. NEW STUDY: We will be doing an eleven part study of 2 Corinthians, which should take us to the end of June. If any ladies would like to join us we would love to have you. We consider this partnership with families in the task of caring for and training their children to be of great importance. We offer you a Children’s ministry that takes place each week: Sunday morning during our service time and special events held at certain times of the year. Children (JK through High School) join us for the initial part of the Worship Service and then go to an age-graded program. On the 2nd & 4th Sunday of every month the Youth will depart for their Program. 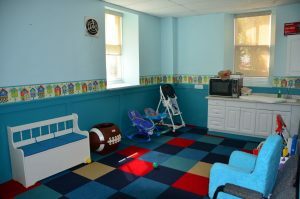 We have regular toddler care available for children under the age of three. 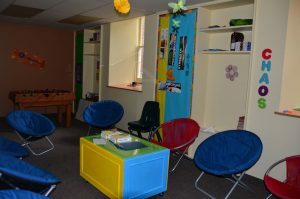 We also have an unsupervised Nursery for any parents needing a quiet place to attend to their babies during the service. There is a speaker in the Nursery to facilitate listening to the service. On Sunday we seek to provide a broad-based learning opportunity for children through high school that runs concurrently with the Sunday Service of Worship. This program runs according to the academic year with a Kickoff Sunday launching the school year on the second Sunday of September. Graduation Sunday concludes the year’s program activities in mid-June. Our Sunday Children’s Ministry begins with children and youth of all ages joining their families in the main auditorium for the initial part of our Service of Worship. This segment of the Service is primarily musical and consisting of contemporary praise selections and high congregational participation. St. Andrew’s Youth are a fun and caring group of young individuals that have a curiosity to learn about life and God. Together we support each other through these critical high school years and the transition period of post-graduation. Together we investigate God’s Word and His desire for a relationship with us. Together we hope to shape our Church, our Community and our World with biblical authenticity. Our Youth are led by a core group of like-minded volunteers here to serve and create memorable experiences that include Sunday Morning Worship and Learning, Fellowship Events, Outreach Ministry and future Youth Retreats so that your youth may remain engaged and have the ability to thrive in our community. We build friendships and mix it all up with a pinch of FUN. Come prepared with an open mind and hungry appetite on the 2nd & 4th Sunday of every month for ‘Bagels and Bibles’!